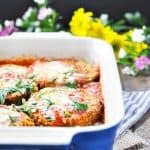 My grandmother's easy Baked Eggplant Parmesan is a delicious vegetarian dinner that only requires 15 minutes of prep! This recipe simplifies the classic Italian dish for a quick-prep, kid-friendly weeknight meal! 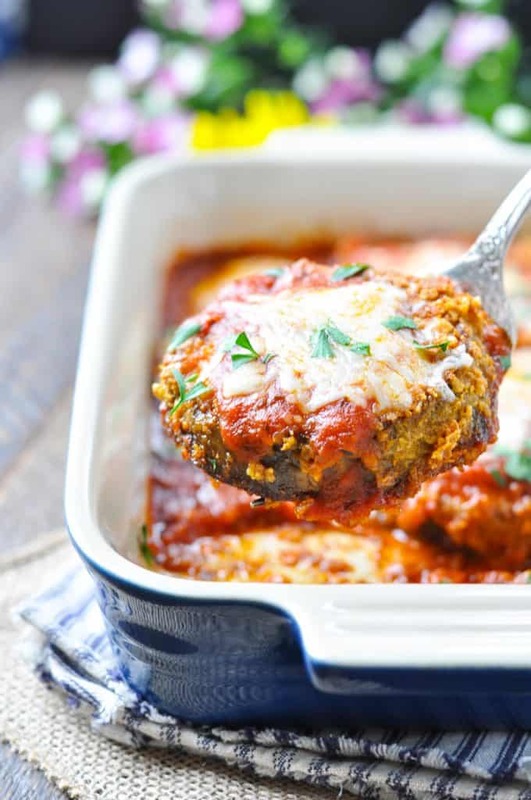 My grandmother’s easy Baked Eggplant Parmesan is a delicious vegetarian dinner that only requires 15 minutes of prep! This recipe simplifies the classic Italian dish for a quick-prep, kid-friendly weeknight meal! 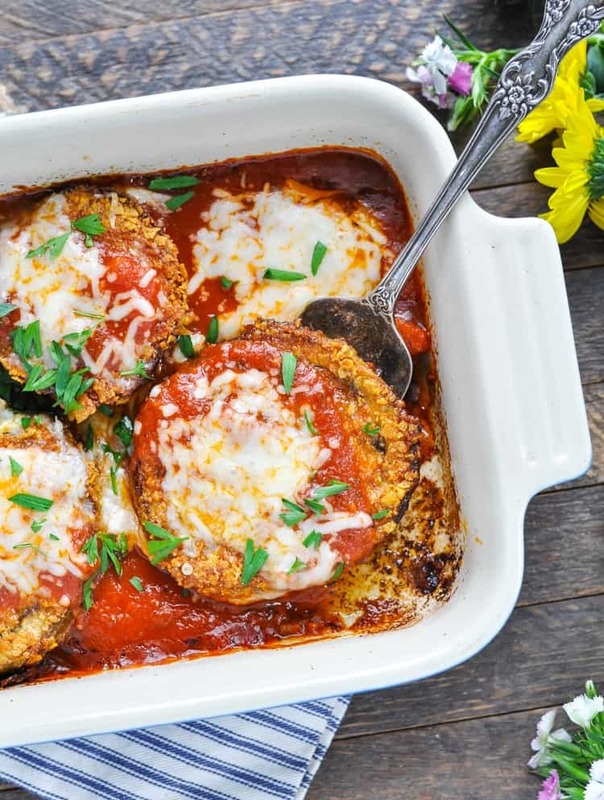 Certain recipes just taste like home, and this eggplant Parmesan is definitely one of those dinners. It’s like a warm hug or an instant transport back to my childhood table. I can almost close my eyes and see it: my 13-year-old self just walked in the door from soccer practice, Dad just came home from work, and Mom is scurrying around the kitchen to get us all fed, bathed, and in bed for the night. The aroma alone takes me back to those happy memories! When Aunt Barbara recently passed along my grandmother’s old recipe box (which is a vintage-looking tin classic! ), I spent hours pouring over all of her recipes. One that instantly jumped out at me was the handwritten Baked Eggplant Parmesan on a weathered piece of yellow legal paper. As I mentioned, this is a meal that my own mom served us throughout my youth, and I suppose she received the recipe from her mom. (3) there was no way that any generic Eggplant Parmesan recipe could live up to the memories of my mom’s homemade specialty. So imagine my delight when I came across the very recipe that my mom had used 30-plus years ago! Even better? It’s BAKED in the oven, which means I spend about 15 minutes preparing the meal and that’s it! No frying pan, no flipping at the stove, and so darn easy! The outside of the eggplant still gets crispy and flavorful (thanks to a buttered dish), but there’s no extra effort on my part. You don’t need to peel the eggplant, the skin is actually full of health benefits. However if you are using up an old eggplant it may be best to peel it as it can turn bitter if it’s not fresh. If you don’t have corn flake crumbs then panko breadcrumbs would also work. Freezing is not advised as the eggplant can retain a lot of water. But the true test came when I served this meal to my boys. Eggplant is definitely not a staple vegetable in this house (although we did attempt growing it in our garden one year), so I honestly wasn’t sure whether or not this dinner would be well received. You guys!!! 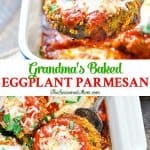 My kids LOVED my Grandma’s Baked Eggplant Parmesan! All 3 of them eyed it suspiciously at first, but after one bite they were sold. Casey announced that it’s delicious because “it tastes like pizza,” and from there we were off and running! I enjoy my Eggplant Parmesan with a salad on the side, while the boys love their carbs in the form of a side of pasta and marinara. Rest assured, this is an easy vegetarian dinner that satisfies even the pickiest meat-loving men! My grandma would be so proud.. 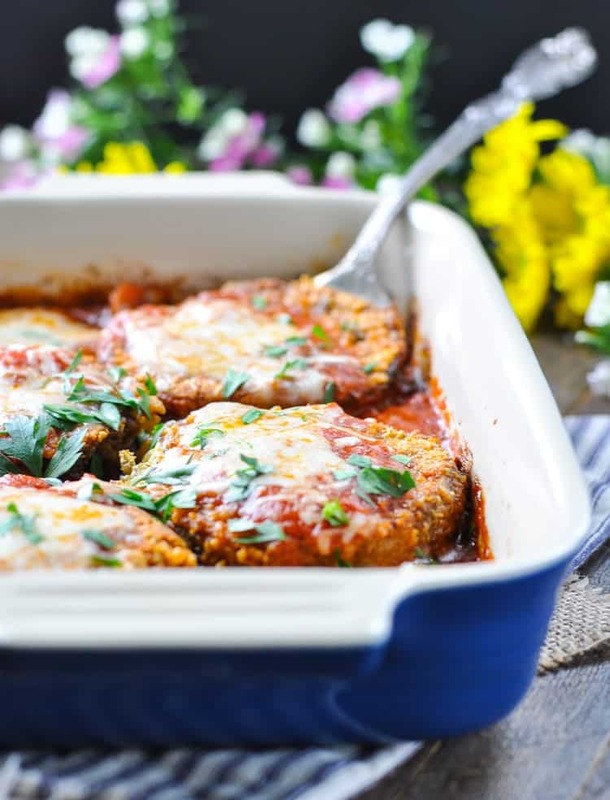 If you’ve tried this Baked Eggplant Parmesan or any other recipe on The Seasoned Mom, then don’t forget to rate the recipe and leave me a comment below! You can follow me on Facebook, on Instagram, on Pinterest, and on Twitter! Pour melted butter into a 11 x 7-inch baking dish. Set aside. Place egg in a shallow dish. Set aside. In a separate shallow dish, combine corn flake crumbs, Parmesan cheese, salt and pepper. Set aside. Peel eggplant and cut into ¾-inch thick slices. Dip each slice in egg and coat with crumb mixture. Place in prepared baking dish. Bake for 20 minutes; turn slices and bake for an additional 15 minutes. Pour marinara sauce over eggplant and top with mozzarella cheese. Bake for 3 more minutes, or until cheese is just melted. My boys love this dish when it's served with pasta and additional marinara sauce on the side! Previous Post: « 5 Healthy Freezer Meals in Less Than 1 Hour! I love meals that instantly take you back to your childhood! 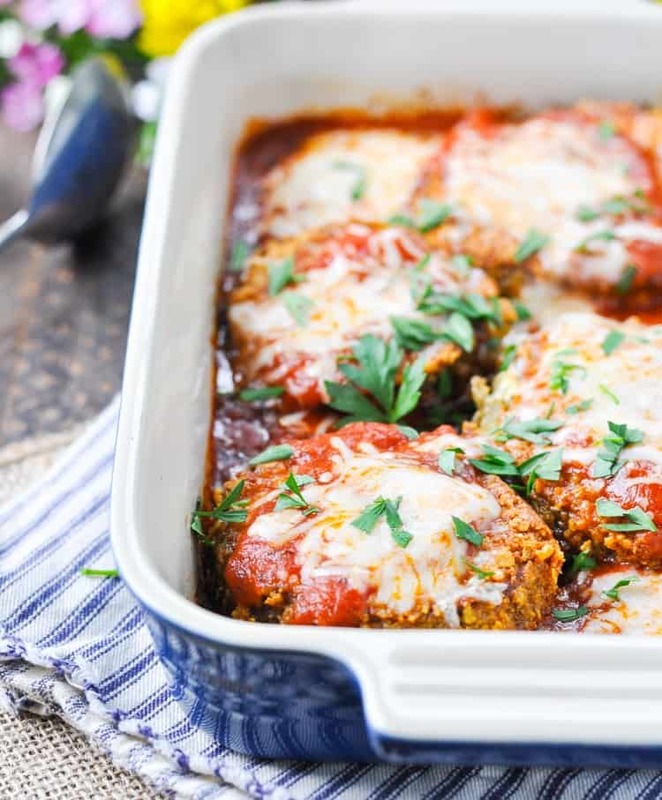 This eggplant parmesan definitely looks like the perfect comfort food dish. I’ve never made it myself before, but I do love ordering it out. I love that this is ready in just 15 minutes! I am making this tonight for my family. BLT’S AND this. I doubled the recipe and did 2 pans. Our eggplants ate huge down here. I just tried this recipe tonight; my picky husband, loved it! It’s a hit! I used 2 baking dishes for a larger eggplant. Hi! Can this be prepared the night before and then put in the oven the next day? I want to make this for Christmas. I just made this and it was so easy to make and tastes fantastic!! 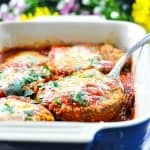 I have been looking for a good eggplant parm recipe and have finally found it!! Your recipes always hit the spot! Thank you! I made this last night for dinner and it was great! I didn’t have corn flakes so I used Italian seasoned breadcrumbs. I will definitely be making this again. Thank you for sharing the recipe! I tried it with breadcrumbs too. It came out soggy. Will try it with corn flakes next time! I made this recipe tonight and just love it but I did not have the cornflakes or breadcrumbs so I used Panko instead and it came out delicious! Great! Glad to know that it works well with the panko too! Hands down, this recipe is your best yet. It was absolutely delicious and loved by the entire family. Tank you, thank you! Yay! I’m so glad that you enjoyed it! I was just thinking the other day that I need to make this again soon. We love it as well! This was so easy and so yummy! Thanks so much for the recipe. It turned out very well. Yay! I’m so glad that you enjoyed it, Becky! Thanks for letting me know! I have been making recipes from your blog for about 5 months and this is my favorite so far! !Thank you!! Hi this recipe looks amazing. Is there anyway to cut down the sodium though? Hi, Alayna! You can use a homemade marinara where you control the sodium, and you can cut the salt to 1/4 teaspoon. The rest of the sodium is largely in the cheeses, which you obviously can’t change. 🙂 Hope that helps! This was awesome! My girls cleaned their plates which is rare! I didn’t have corn flakes so used bran flakes and doubled the parm. Thanks for a great go to for the future! That’s great, Meggan! Way to get resourceful with the bran flakes. 🙂 And yes — I was so pleasantly surprised the first time that I served this to my kids and they loved it! What are corn flake crumbs? Actual corn flake cereal? The corn flake crumbs are literally crushed up Corn Flakes cereal. You can also buy cornflake crumbs in a canister (similar to bread crumbs) if you prefer the shortcut. Either option works, but I usually just use the actual cereal and crush it in a Ziploc bag with a wooden rolling pin. Takes two seconds! OMG! I’m transitioning from meat! I tried this recipe last night! My husband and kids are meat people! They throughly enjoy this eggplant parm! They came back for seconds! Thank you so much for this recipe! And it was so easy! I’m hooked! That’s wonderful, CoCo! I’m so glad that you enjoyed it! I found the same to be true in my house — even my meat-loving boys enjoy this dinner! This recipe was fantastic! My non-vegetable eating boyfriend ate every bite and loved it. Super easy. I will make this again and again. Why do you add the sauce at the end and only bake it for 3 minutes? Most eggplant parm recipes include the sauce in from the beginning. Thanks. Hi, Priya! I do it that way because that’s how my grandmother said to do it. 🙂 Seriously, though — it works perfectly, so I’ve never felt the need to change the process. Many eggplant parm recipes require you to fry the eggplant in a skillet before it goes in the oven. Since this eggplant isn’t fried in a skillet at all, it gets crispy and the “fried” texture by baking in the oven before adding the sauce. I would worry that adding the sauce earlier wouldn’t allow it to get crispy, and you’d have a soggy end result. Hope that helps! I made it today! It’s really good! Great! Thanks for letting me know, Jose! Isn’t it delicious, Jean! I’m so glad that you’ve found a way to enjoy a favorite at home! 🙂 Thanks for letting me know! I just made this today. Wow!! It’s amazing. I’ve had 3 helpings today. 😳😳😳. My teenager liked it as well and thought it was chicken. 🤣. Put half of recipe in freezer. Hope it freezes well. First, Thank you for this recipe. I’m in the process of making it for dinner right now and I have high hopes for it. However, I have a small complaint. You currently have 116 ad trackers and/or ad pixels on your website which causes it to load ridiculously slow. I’m all for ads on your site to generate revenue but that is just ridiculous. Hey, Matt! Thank you for your feedback — I do appreciate it! If you use breadcrumbs – double bread the slices! No sogginess and absolutely perfect! Hi Blair! I’m only beginning to experiment in the kitchen as I am out of college. I usually like to cook for my family of 4. I am making this meal tonight and I am super excited! Your story and use of words is exquisite! I was wondering if you could tell me what kind of “corn flake crumbs” you mean by this. Thank you! You have two different options for the cornflake crumbs. You can either purchase a box of regular Cornflakes cereal, put it in a big ziploc bag, and crush it with a rolling pin or mallet until the flakes are the texture of coarse breadcrumbs; OR you can purchase a canister of cornflake crumbs. The canister of cornflake crumbs can usually be found in the grocery store near the breadcrumbs and other similar coatings (like “Shake n’ Bake, etc.”). Buying the cereal and crushing it yourself just adds an extra step to the preparation, so pick the option that works best for you. Enjoy, and thanks so much for your kind note! Hi Blair. I want to fix this recipe for a vegetarian friend who is coming home from the hospital after having a new baby. She was originally coming home Sunday which would have allowed me to bake it and take it. However, she needed to stay until Monday. I work weekdays so my question is can you put this together ahead of time and bake omitting the marinara and mozzarella, refrigerate overnight and take with final instructions by heating up the dish with marinara and cheese? Or will it become soggy. Thanks for your input and a great sounding recipe. Hi! This is a great option for your vegetarian friend! I haven’t tried this prep-ahead method myself, but I *think* it would work well. I’m guessing that it will be slightly less “crispy” than the original version, but it will definitely still be delicious. I eat this eggplant parm as leftovers regularly, and it still tastes amazing. Your suggestion for reheating with the sauce and cheese should work fine! Just tried this recipe for the first time tonight and it came out amazing! My husband went back for thirds 😂 I’ve never cooked with eggplant before but I know I’ll definitely be making this recipe again!! just kidding I did make it for my wife though and she and I both were amazed at how good it was !!! Would this still work if I left the skin on? Thanks! I’m going to make this egg plant parm tonight. Do I need to sweat the egg plant first? I was going to make this exactly as the recipe directed. But my sweet family member who ran to the store accidentally got fruit sweetened corn flakes which were too sweet to use lol. So I happened to have rice chex cereal on hand and used it. Turned out perfect. This recipe is so delicious. Will be added to our favorite recipes. Hah! I’m glad that you didn’t use the fruity flakes! 🙂 Glad to know that Rice Chex work as well! Glad you said rice Chex! I was just thinking I don’t have cornflakes on hand but do have breadcrumbs, but per reviews saying may be soggy. Then when I read this comment, I remembered I do have the Chex! I love eggplant I like eating it cold I’m going to try it your way it sounds easier than the way I make it eggplant is my favorite sandwich okay thanks your way sounds yummy. This recipe is amazing!! First time ever trying eggplant parm and I will be making this again. Thanks so much for this delicious recipe! HOLY MOLY this was SO delicious!! I’ve always wanted to try eggplant parm and include more meat alternative meals and this is going to be a staple. I didn’t have corn flakes so I substituted for panko and it was delicious and crispy! Thanks so much for the recipe! We can’t wait to make it again. I made homemade marinara from my Roma tomatoes, also from the gardening with fresh basil. I still have more eggplant, so I might just make this again tomorrow night!!! Absolutely LOVED this receipe! It has been over 15 years, no kidding, since I’ve had this dish. My mom passed away and she use to make eggplant, I never had the chance to sit with her to get the receipe. Hubby liked it as well! So I loved the flavor of the final product but I had one pretty big issue in the preparation part. For the life of me I couldn’t get the crumb mixture to stick to the eggplant after I dipped the slices in egg wash. I’m not sure if there is something I should be doing differently but I ended up having to kind of slap some on and strategically put the in the pan so the crumbs would stay. Any suggestions? Or anyone else have this issue? Is it necessary to use all of the butter called for in the recipe? Hi, Janet! I don’t know. 🙂 I’ve always made it this way using my grandmother’s recipe because we like it and I know it works. I haven’t tested it with different amounts of butter, but you can certainly give it a try if that’s what you prefer. 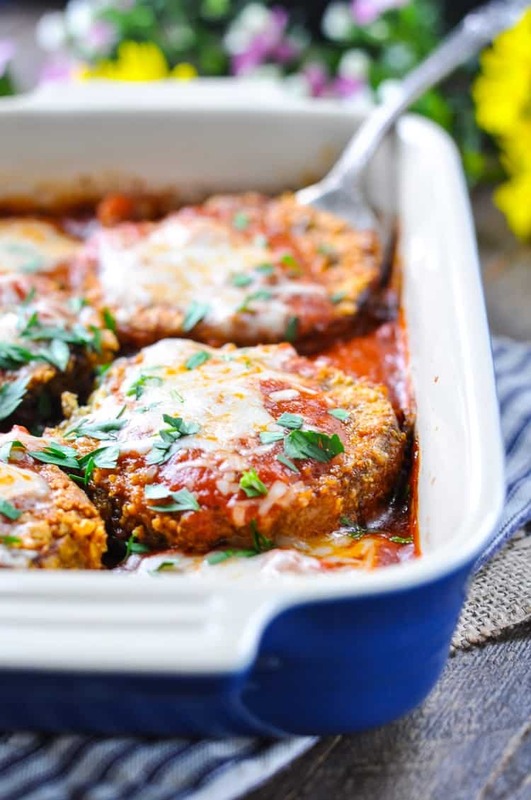 Your Eggplant Parm recipe sounds yummy and I’m anxious to try it! Was wondering if you’ve prepared it or part of it a day ahead?? Pressed for time this wkend and hoping to be able to “pre” prepare! Hi, Jean! I honestly have NOT prepared this particular meal in advance, so I don’t know how it would turn out. I regularly enjoy leftovers the day after, though, and it’s always delicious! This was so delicious and satisfying thank you for sharing .. So nice to eat healthy and still enjoy. I would like to try homemade marinara sometime..I only bead breadcrumbs and it was great! I tried this recipe with homemade “Sake ‘n Bake”. It was delicious! We’ve rarely had eggplant in the past, but after my brother gave me some small eggplants from his garden, I had to do something with it. It was a real hit with my family. I tried this recently and OMG it was so easy and delicious! Thank you for sharing this recipe. I did actually use wheat bread crumbs and they came out nice and crispy. I did make my own marinara sauce and i doubles the recipe! This one is a keeper!! I have tried many recipes and this is by far the best. Thank you! It’s delicious. Delicious… Was a big hit with the whole family… Soooo quick and easy!! Hi Blair – I am a broke college student renting a place near campus that doesn’t even have an oven, just a toaster oven we bought. I don’t have energy after school and work to stand and try something, and I thought I would never be able to make my favorite meal myself. However, I had a slow week this week and decided to try this recipe in my toaster oven – and it came out FANTASTIC!! I’m feeling like a regular chef over here. Thank you for sharing this! This is incredible and so easy! I did use panko and fresh mozzarella and was amazing! Thank you!! Wickedly happy my hubs does not like eggplant. I get it all! And soooo yummy! It was a hit! Thank you for sharing! This is a make again dish for sure. I have made several much more complicated eggplant parmesan recipes in the past, but this by far tasted the best! I love how quickly it comes together. Even my carnivorous husband ate a plate of it without complaining! Will definitely be making this again in the future. I came here to say that I was VERY skeptical of this recipe. I have an old fashioned eggplant Parmesan recipe that I love so so much but it’s so messy to make and it takes forever to fry all the eggplant. This is a quick alternative that is not only easy to make but also tastes amazing. I am so glad I found and tried this recipe out!